I wonder if it's all online. Thanks for the clips and photos. I wonder if Brad Bell was just ashamed of the Spectras. His idea of "comedy" seems to be more along the lines of the latest scene where people tell Brooke she is a whore/Stephanie goes wild. That and Pam/Donna Duck. Perhaps he feels like he created those characters (since the Logans of today bear zero resemblance to anything Bill Bell created) so it shows how great he is. A few bits from a summer '88 Digest. Sorry about the scanner light - the other one I took down because it was a bit too much of a glare. All things considered, B&B wasnt too bad with the retcons. It could have been a whole lot worse like what happened wtih the Lord family on OLTL from their original inception to today. 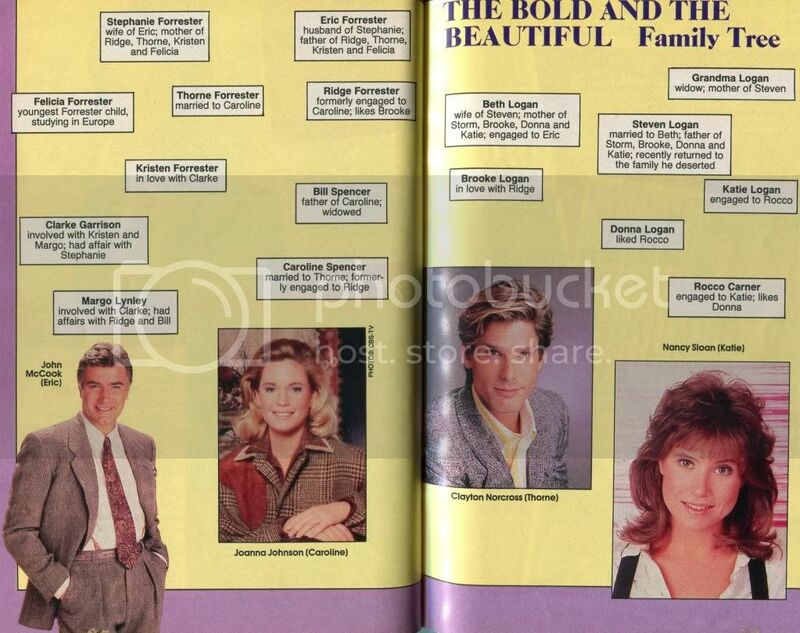 I remember the B&B book, which was a real labor of love, had a lot of cast shots. Look at poor KKL rocking the Nancy McKeon dress sense in that first one. I didn't think Michael Swan was on the show in 1997. How do I add more than 2 YT videos? 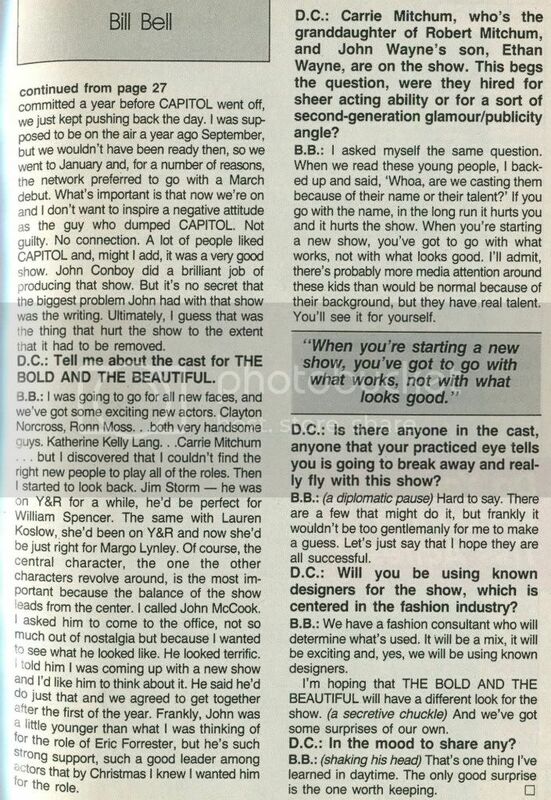 Um, so we have that ever lengthy thread on classic Y&R articles and discussion, I was wondering if we could do one for B&B? I mean the whole show is a hot mess and has been well at least since 2007/2008 and unwatchable but I'd like to think back to when I loved the show 1991ish-2006. A lot of stories liked and/or remember well have now been long forgotten like Ivana's murder and the mystery around it, Macy vs. Karen, Connor(someone mentioned him recently!) Dylan and Michael, CJ/Becky, Sly, Grant. Hell Macy was my favorite character right after Sally of course. B&B is the only soap left that holds my interest. IMO, it's the most entertaining and consistently delivers. I've never HATED, HATED any SL, nor have been driven to stop watching. As long as Brooke and Stephanie are there, I'll watch. 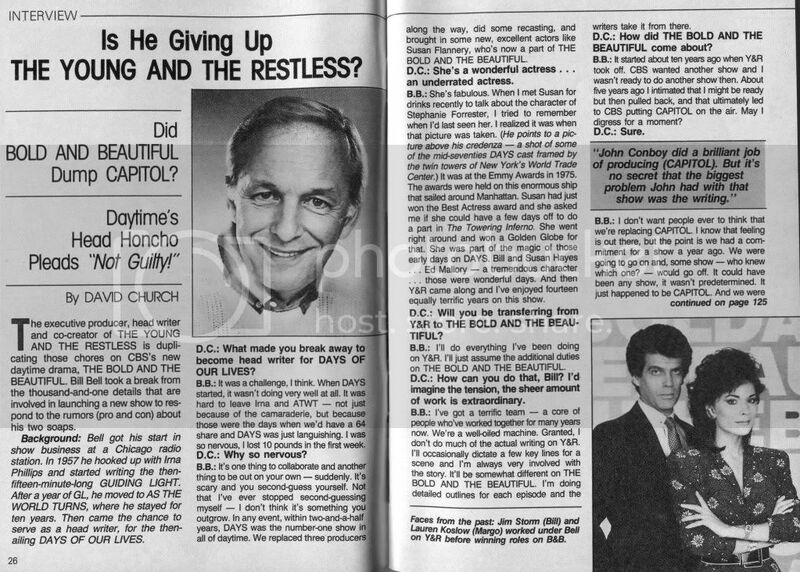 June 2, 1987 Digest. Again sorry about the glare. If you want anything typed out, let me know. That's great. I do wonder why Pierce was in there...not really a love. I actually own both B&B books. They are both awesome collectors items. KKL looks so FIERCE in that picture with Thorne. I wish she'd have kept that hairstyle- she looked like a million bucks!